Bright, colorful and nutrient-packed, this super easy Quinoa Pomegranate Salad is the perfect dish to enjoy this fall. Serve it as a side, or make it a light lunch by adding your favorite protein! Quinoa based salads are great for many reasons: they are hearty, they’re filling, and they make a nutritious meal that is portable and easy to eat. Technically not a grain, but a seed, quinoa is gluten free, high in protein, fiber, B vitamins, minerals (particularly iron and magnesium) and antioxidants. It’s incredibly versatile and can be paired with pretty much anything! 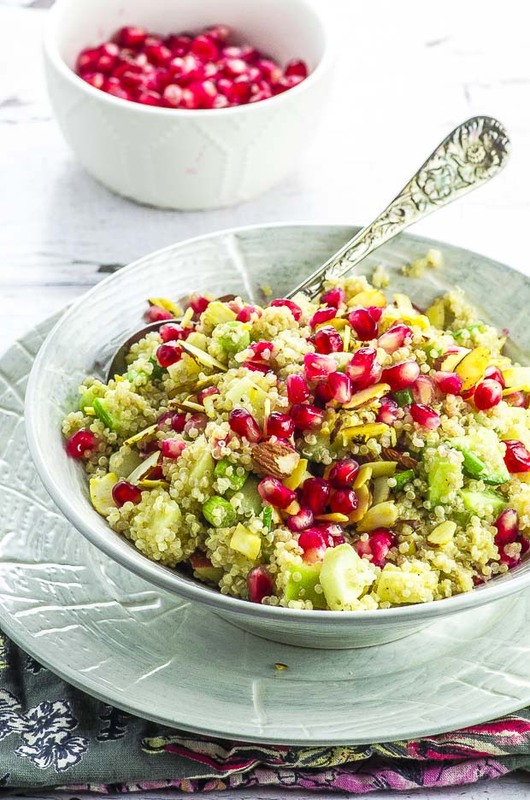 Here we’ve combined quinoa with another superfood, pomegranate, to create this super tasty quinoa pomegranate salad. 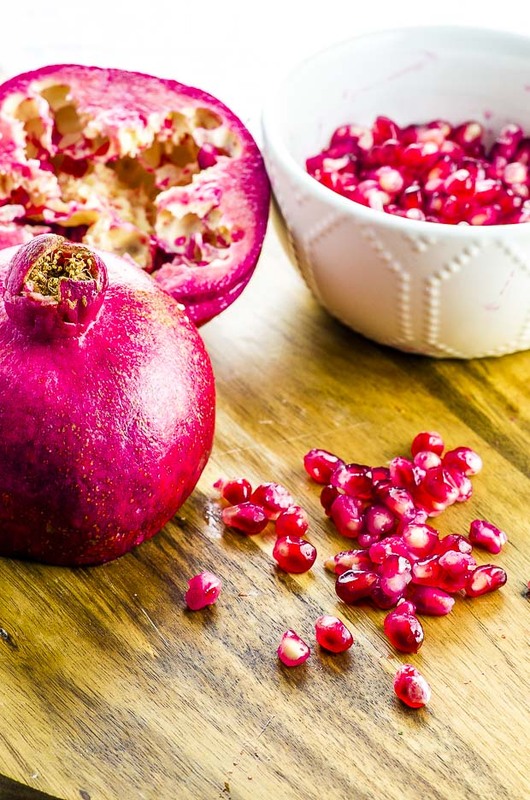 Pomegranate seeds are packed with fiber, vitamins and powerful antioxidants, and have incredible health benefits. They’re considered one of the healthiest foods in the planet! Score the pomegranate horizontally down the middle. Gently twist both side to separate the halves. Fill a large bowl with water. Place one of the pomegranate halves on your hand, cut side down, and tap the top with a wooden spoon. The arils will fall out into the bowl, and the little pieces of yellow skin will come to the surface, so they can be easily removed. Repeat the process with the other half. Enjoy it and Happy Fall! 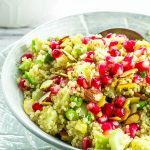 Bright, colorful and nutrient packed, this super easy Quinoa Pomegranate Salad is the perfect dish to enjoy this fall. Serve it as a side, or make it a light lunch by adding your favorite protein! 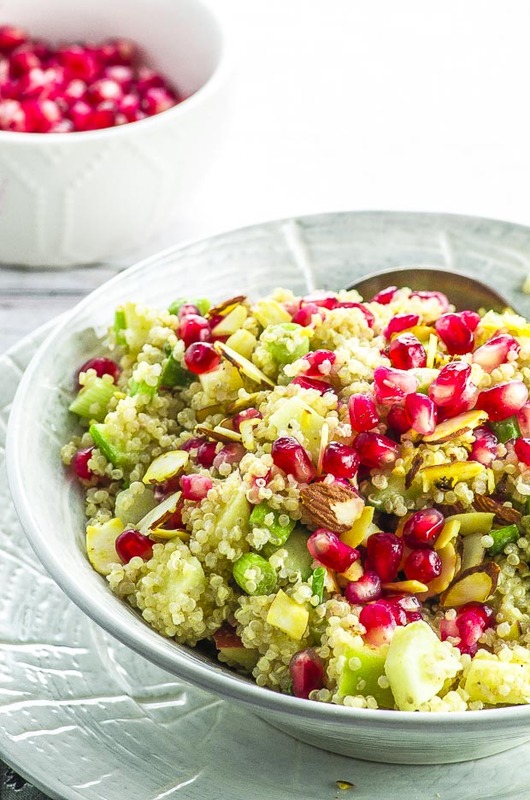 Did you like this Quinoa Pomegranate Salad recipe? Share it! You didn’t? Tell us why! You want to make it, but you have questions? We’re here to help! Connect with us via Instagram, Twitter , Pinterest or Facebook or simply leave us a comment here. We want to get to know you! Pomegranates and tahini in salads are my favorite!! This seems like the perfect combination of sweet, salty, crunchy and hearty…yum!